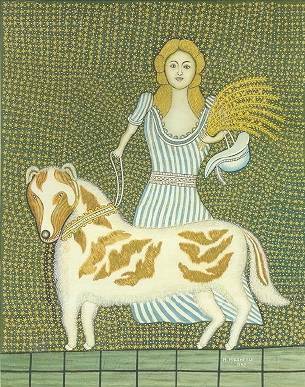 "Morris Hirshfield came to the United States from eastern Europe at the age of 18. Like many other Jewish immigrants of this period, he found work in the garment industry, at first in a women's coat factory. 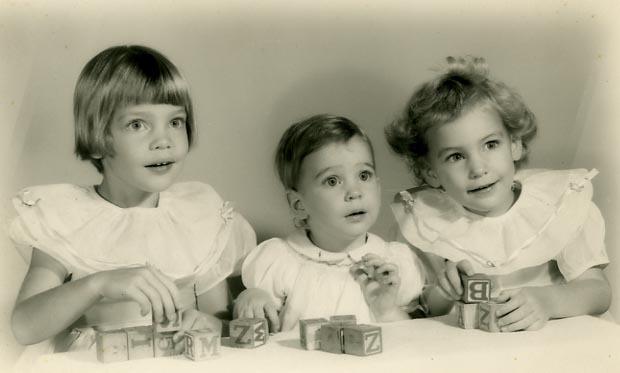 Hirshfield soon opened his own coat factory with his brother, but after 12 years, they started a new company, the EZ Walk Manufacturing Company, which made women's "boudoir slippers," as Hirshfield called them. 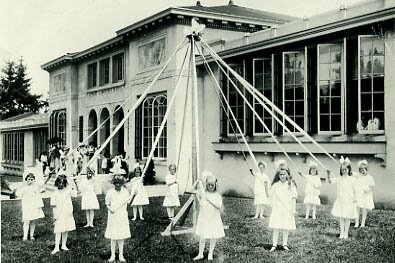 This business operated with great success until Hirshfield became ill and then retired. In 1937, at the age of 65, Hirshfield began to paint, much to the bewilderment of his wife and family. 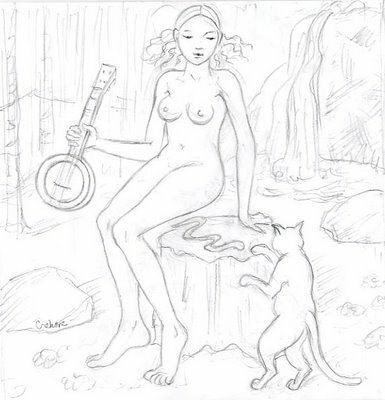 The subjects he was immediately drawn to were women, animals, and occasionally themes from his Jewish heritage. 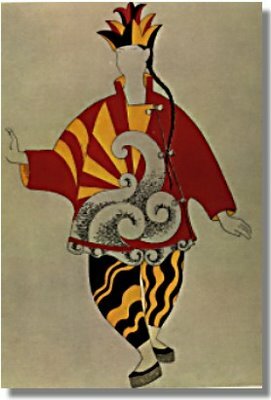 A record of Hirshfield's life and career as an artist was written by Hirshfield himself for Sidney Janis's 1942 book They Taught Themselves. Janis had come upon Hirshfield's paintings a few years earlier while organizing an exhibition called "Contemporary Unknown American Painters" for the Museum of Modern Art. 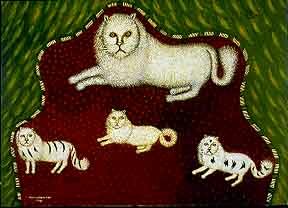 Upon seeing Hirshfield's Angora Cat, he immediately included work from the new artist in the exhibition. In 1941 Hirshfield was given a one-man exhibition at the Museum of Modern Art that included 30 paintings." 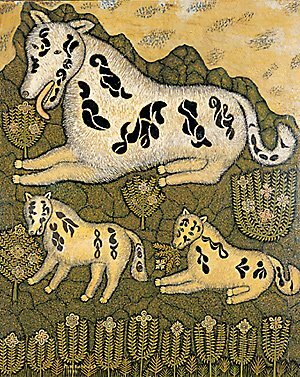 I love Morris Hirshfield. To think it only took him 4 years to have the show of a lifetime at MOMA with the 30 paintings he had done up until that point. He completed only 77 works of art before his death- 9 years after he started painting. Here's Ray Caesar's art on the cover of the upcoming issue of Hi-Fructose magazine. He creates his art on the computer with a 3-d modelling program and scans in the fabric. Simply amazing how much soul he gets in his faces and the old-fashioned feel to his tableaus. They are every bit "paintings", but he uses the computer instead of a brush. Check out his unique sense of fashion design, too. 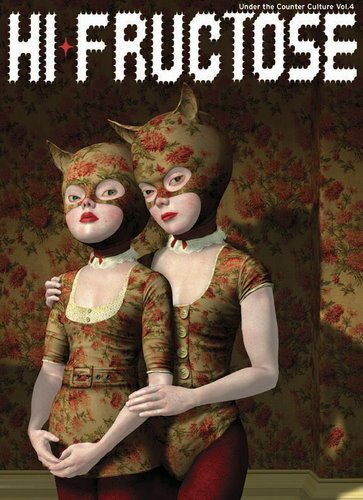 Ray Caesar is a truly inspiring and creative modern-day Victorian surrealist. He's got the WOW factor. 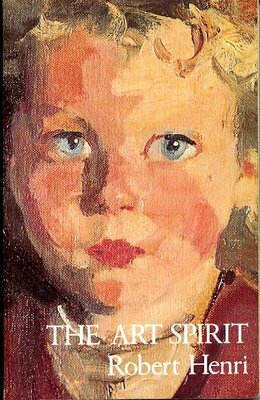 This book is a bible for painters like me: "The Art Spirit" by Robert Henri, written in 1923. I have read it at least ten times and I am reading it again. Robert Henri was a great teacher and a great painter. The more I read it, the more I can relate to it and the more I get out of it. I am recommending it to any painter who has not read it! These are amazing hand-crafted sculpture-photos. I like the one of Burning Man especially. We have one of these at home. 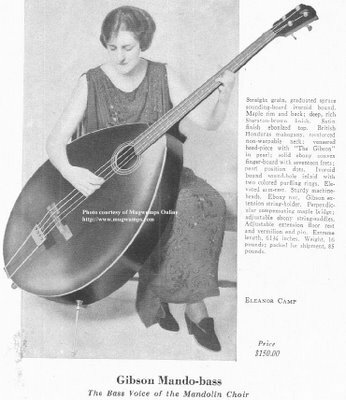 You can play the Gibson Mando-bass upright or sitting... like this woman in the picture. It's a beautiful piece of furniture. I might have to work on my drawing of the bear - not quite there yet. 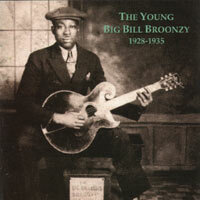 Here's a picture of Big Bill Broonzy with the Gibson guitar that I mentioned in my previous post - on an album cover from Yazoo Records. Yazoo always had a great selection of hokum music with wonderfully illustrated album covers by R. Crumb and Robert Armstrong (two of my favorite underground comic artists who also had a great band called Cheap Suit Serenaders). page at Frets.com to see close ups of his painted instruments!! Here's another new Blues Gal drawing. 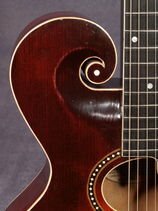 This one has a Gibson Style O Guitar from 1920 in it. We don't have one of these guitars at home, but we have others in the Gibson guitar family such as the teardrop-shaped Mando Bass and the cubist-looking Harp Guitar. All are classic beauties just like this girl who is feeding an acorn to her pet squirrel. I'm listening to The Essential Nino Rota Film Music Collection as I draw. Drawn! 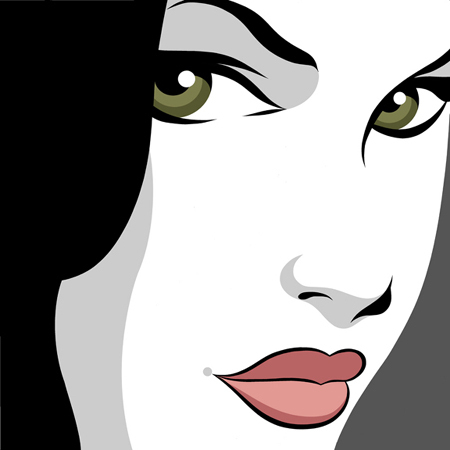 The Illustration and Cartooning Blog is such a great blog. It is well-read across the world. That's because they continually post about wonderful artists day-after-day-after-day. I have been working away on some new drawings. I'm trying to expand my new blues gal series. It's interesting how some of my motifs overlap. Early blues and hokum stringed instruments are often the same as the Hawaiian ones: National guitars and ukes (banjo-ukes and koa wood ukes). Cats in the woods, why not? Waterfalls in the woods. Ditto. This drawing probably needs more work...it's just one of my new ones. By the way, there is only one week left to go see the Blab! Show. Copro Nason Gallery in Santa Monica, CA is open from Wed-Sat, Oct 18-21st. This is a nice figure. I might have to buy this for someone I know who collects them. I like these anime figures much better than some of the designer toys. They seem to have a lot more going for them. I did a painting for the Women With Issues Show at M Modern Gallery in Palm Springs, CA. It opened on Sept. 23, 2006 (same day as Blab show). The show was a Valley of the Dolls theme show and I think they also had vintage photos for sale of Patty Duke and Sharon Tate. Here is a photo of Mamie Van Doren from the Blond Bombshell show at the same gallery last January. I got to go to that one and it was fun. Mamie certainly does not look her age! I bought this book at Powell's Bookstore while I was visiting Portland last week. It's full of great sepia-toned images of uke playing hula gals, sailors, album cover art, matchbook covers, vintage Hawaiian postcards and old advertising graphics, Trader Vic stuff, you name it. I don't know how I did without it for so long. It's by Taschen, edited by Jim Heimann. Only $9.99. Scarefactory's Haunted Furniture page is chock-a-bloc with amazing haunted props for your haunted house. Makes me want to redecorate. My bookcase is filled with inspiring art books. 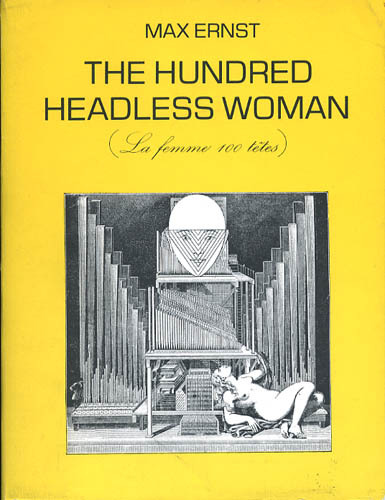 I have three of Max Ernst's surrealistic collage novels. One of them is "Une Semaine De Bonte" which is a Dover book on Amazon for only $12. The other two must be harder to find because Amazon doesn't even have pictures of the covers and they are now in the $55.-$140. range - used. I love these books! ErlingWold is a composer in San Francisco. He ordered a couple of my Little Pierrot prints recently which prompted me to go look up his website. Very intriguing! By the way, he was also the winner of my blog guessing game...so I sent him an additional print. He, in turn, sent me a CD of soundtrack music that he composed for the film, "The Bed You Sleep In" (director, Jon Jost). It's darkly moody and also enchantingly spirited. 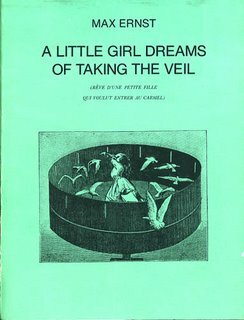 "His critically acclaimed work A Little Girl Dreams of Taking the Veil, based on the Max Ernst collage novel, was presented by the Paul Dresher Ensemble and ODC in 2000. It was given its European premiere in a German version by the Klagenfurter Ensemble in July of 2001 and toured to Max Ernst's hometown of Brühl. " 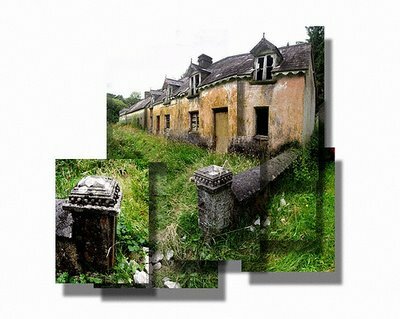 I may have to order the CD which looks quite wonderful. This is only one of the many McMeniman Brother's group of vintage buildings (lodges and pubs) in OR and WA that they have restored and decorated. Each one is unique and each one is full of artwork. I have not stayed in all of them, but I hope to some day. See nine of Fred's paintings on the Blab Show website or go see them in person at Copro Nason Gallery, Santa Monica, CA. Show closes on Oct 21. Walter Minus is one of the artists in the Blab Show this year. His paintings are very large and striking. Hanging next to each other, they seemed to have some sort of magnetic power. Walter wrote me a nice note from Paris the other day telling me that he appreciated seeing the photos on my blog of the art show because he could not be there in person. He has a new Blab Storybook out now called "Darling Cheri". It's nice. You can order it from Amazon or Fantagraphics. 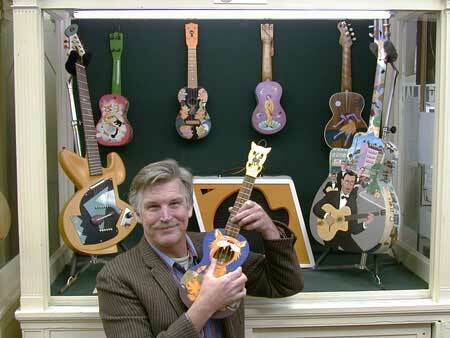 Go see Walter's paintings in the Blab Show before it closes Oct. 21st! I came across this story online recently. 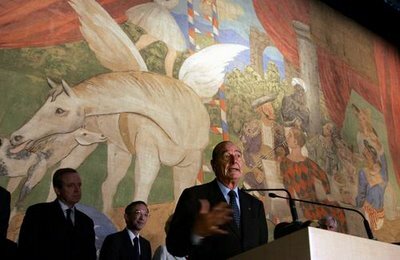 About two years ago, last October, Picasso's huge curtain masterpiece, which he painted for the 1918 ballet, "Parade", was hung for 10 days in a glitzy shopping mall in Hong Kong. It was to celebrate 40 years of diplomatic relations between France and China. I love this period of Picasso's art. I love this curtain. Jean Cocteau wrote the script for "Parade". Erik Satie was the composer. Picasso designed the sets and costumes. Some of his cubist-style costumes were made of cardboard! The painted sketches for the costumes are inspiring pieces of art in their own right. Great designs full of color and mischief. Jean Cocteau added crazy things to make noise such as a typewriter and a foghorn. Satie and Cocteau were labled "Cultural Anarchists" and Satie went to prison for 8 days. It all took place in Rome. Someone just guessed the right answer. That's me in the middle of the photo in my previous post. I will send that person a Little Pierrot Print. Guess which one is me? I'll send the first person who guesses the right answer a signed, limited edition "Little Pierrot Print". This past year, I got to see Fred Stonehouse paintings in person at his solo show in L.A. in April (Koplin Del Rio). He also came down to see my art at the Applegate Gallery in Santa Monica right after his opening. 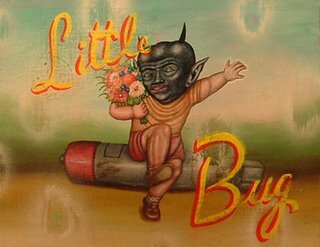 I was exhibiting 4 of my "little pierrots" and some "monkey love" paintings (6 in all). before it closes on October 21, 2006. I have eight paintings in this show and Fred also has a bunch. The new issue of "Blab! 17" should be available in November, 2006 with my art in it!